Has anyone been waiting for me to write about one of the big dahlias? I love the big ones too; it was they that first stole my heart at the King County Fair in Enumclaw when we moved to the PNW from Illinois in 1970. AC Casper looks like a big, gorgeous – you guessed it – ghost! 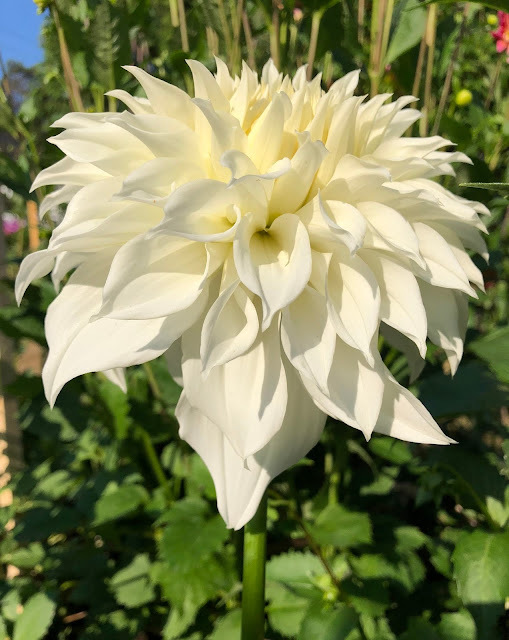 One of the purest white large dahlias around, his petals get longer towards the back of the bloom so that they drape a bit down the stem. I’ve not seen another large white dahlia variety that does this, and AC Casper seems the perfect name. I acquired ACC in this off season and am just plain excited to see him blooming in the garden! AC Casper was introduced to dahlia lovers in 2014 by Ken Greenway in Snohomish, WA. ACC is officially an Informal Decorative dahlia in conformation, and size A, which means his blooms regularly span 8-10”. Like most “dinnerplate” dahlias, this one blooms on very thick, strong stems. Unlike many this large the stems are relatively long, about 10-12”. With his upright presentation on the stem this length makes AC Casper easy to display in a vase and even include in a bouquet. A large bouquet, of course! 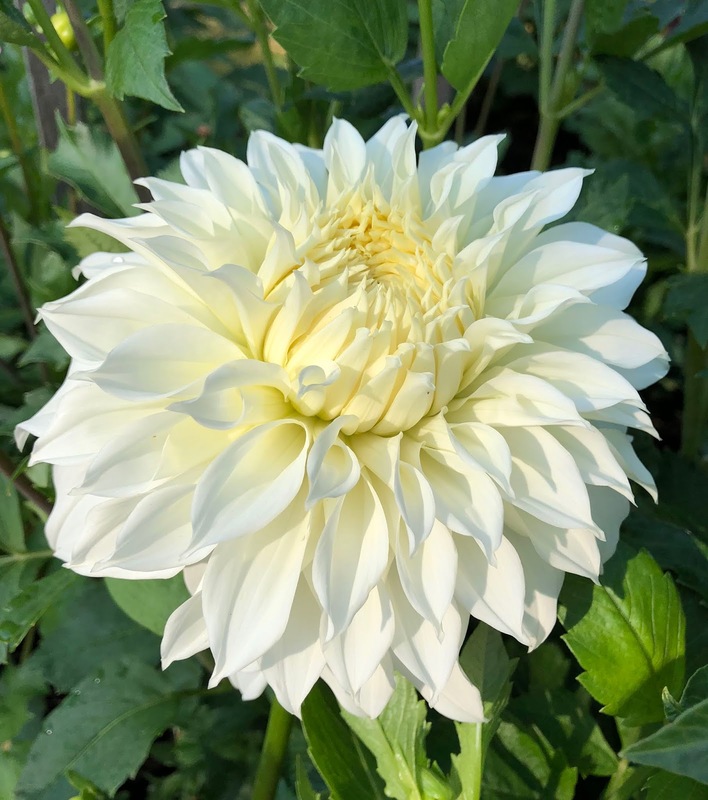 The 2018 Dahlias for Seniors fundraiser for the Shoreline-Lake Forest Park Senior Center is going gangbusters; I’ve added a third dahlia delivery day each week to our two sites and they are selling out in less than a day! You can pick up a bouquet at the Shoreline - Lake Forest Park Senior Center, 18560 1st Ave NE, Shoreline 98155, on Mondays, Tuesdays and Thursdays after about 10:30am. And at the Ridgecrest Public House, 520 NE 165th St, Shoreline 98155 Tuesdays, Fridays and Sundays shortly after opening.